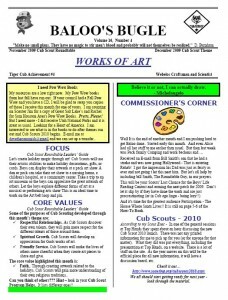 Baloo's Bugle is a monthly newsletter published by the US Scouting Project. The November release (PDF) features next month's theme - Works of Art. November's theme (Cub Scout Salute) is covered in the October issue (PDF). Enjoy.